Welcome back to another exciting episode of Mr. Pig Live! Today's guest is extra special because she's brought cake. Oh, and er, she happens to be my dear friend and neighbor. 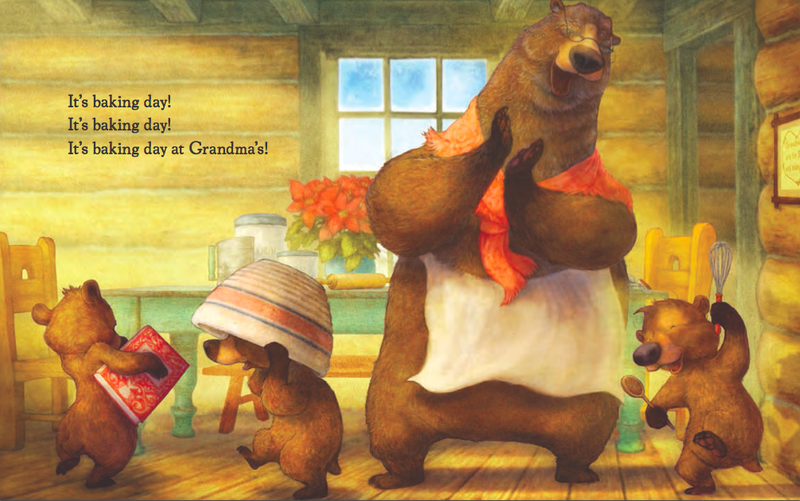 Let's give a big paw to the lovable star of Anika and Christopher Denise's new picture book, BAKING DAY AT GRANDMA'S, the one, the only . . . Grandma Bear! Welcome and thanks for the delicious cake, Grandma! What is your full name? Now, is that appropriate, dear? Oh dear. I don't want to offend a sizable bear. Next question . . . What is the best thing about being you? Let’s see. . . . I have three adorable grandcubs, and I own a lovely cabin in the woods. What is the worst thing about being you? Shopping in the Big and Tall section at Bears R Us. Pictures of my three grandcubs, tea, chocolate. Snowy. Cold. Baking something delicious with my grandcubs. From BAKING DAY AT GRANDMA'S by Anika Denise. Illustration copyright 2014 by Christopher Denise. Baking with Julia by Julia Child and Wild About Bears by Jeannie Brett. Two of my favorites! Speaking of favorites, what is your favorite word? The too-quiet sound in the house after the grandcubs leave. Betty Bunny (we share a love of chocolate cake) and the two twin bakers from In The Night Kitchen. A hanky and a peppermint candy. Guests who say no to dessert. What was it like working with my fellow Cottager Anika Denise? Oh, lovely, dear. She sure enjoys her sweet treats—so we got along splendidly. I'm quite fond of her, too. Thanks for joining us, Grandma Bear! Before you go, let's watch a clip of Anika and Christopher Denise baking a cake just like the one you made with your grandcubs. Yum! 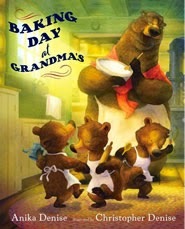 Anika Denise is the author of Baking Day at Grandma’s (Philomel, 2014), Bella and Stella Come Home (Philomel, 2010), and Pigs Love Potatoes (Philomel, 2007). In 2016, HarperCollins Children’s Books will release her forthcoming title, Monster Trucks! Her books have been praised by Parents’ Choice Foundation, The Bulletin for the Center for Children’s Books, Publishers Weekly, School Library Journal, Booklist, Kirkus Reviews and the Rhode Island Center for the Book. 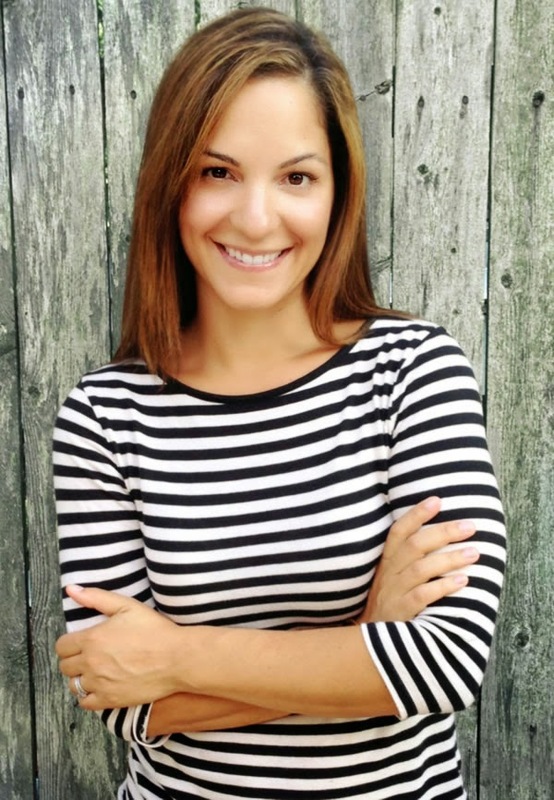 She blogs for The Little Crooked Cottage and lives with her husband and three daughters in Barrington, Rhode Island. 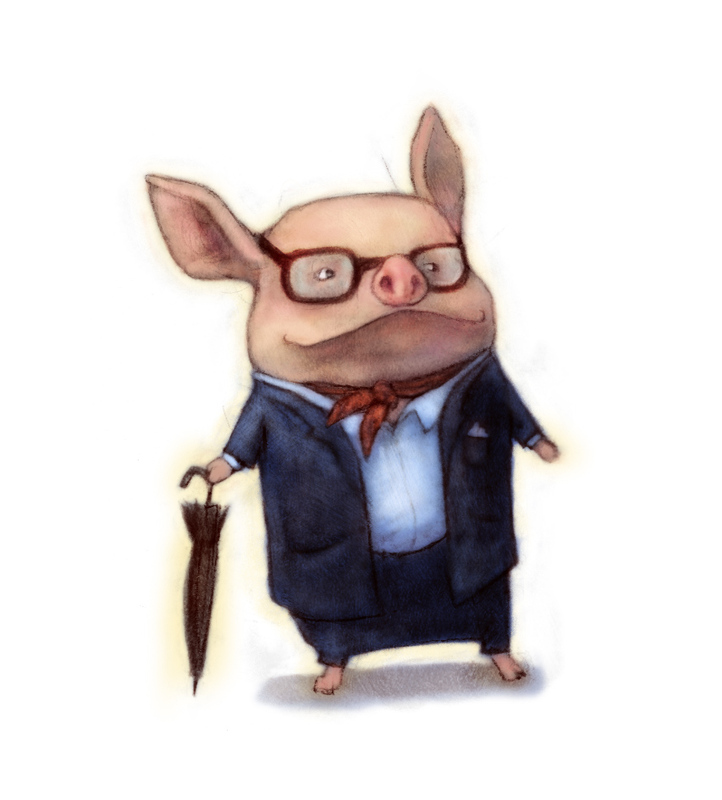 Christopher Denise is an award-winning children’s book illustrator and visual development artist. His first book, a retelling of the Russian folktale The Fool of the World and the Flying Ship, was pronounced “a stunning debut” by Publishers Weekly. Since then, Chris has illustrated more than twenty books for children, including Alison McGhee’s upcoming Firefly Hollow, Rosemary Wells’ Following Grandfather, Phyllis Root’s Oliver Finds His Way, his wife Anika Denise’s Bella and Stella Come Home and some in Brian Jacques’ acclaimed Redwall series. 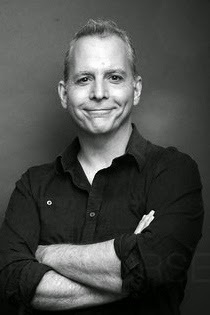 His books have appeared on The New York Times bestseller list and have been recognized by Bank Street College of Education, Parents’ Choice Foundation, and the Society of Illustrators Annual Exhibition. Christopher Denise lives in Rhode Island with his family.